Since supermarkets and superstores became the norm for shoppers, most food reaches the table after passing through a complex supply chain that moves it from growers, producers, and factories to a network of wholesale food distributors and grocery store distribution centers, from which products are ultimately delivered to store shelves. This type of distribution network works best for large inventories of shelf-stable, packaged food. These types of food command higher margins since shipping and storage costs are lower. They are less prone to spoilage and damage during shipping, so expensive equipment to prevent waste is not required. Packaged goods are also distributed in large crates and boxes, so they generally do not require as much careful handling. Foods that can’t be stored and handled as easily are distributed via other models. These include specialty items that are available seasonally or in limited quantities, or that are not shelf-stable. Some items, such as produce, are shipped by specialty distributors that have invested in the equipment to store and maintain the freshness of these products. Some of these distributors are actually family-owned, integrated grower-shippers, or growers who supplement their own crops with those of others. These grower-shippers deliver their produce to grocery store warehouses or other wholesalers that distribute them to stores, retailers and restaurants. Another category of food producers/distributors are suppliers of food products that occupy the space between shelf-stable products and fresh produce, such as baked goods, meats, and dairy. These products have a shelf life that can be measured in weeks, rather than days or months. For these products, a distribution model called Direct Store Delivery or DSD is commonplace. DSD products are sold and delivered direct from the producer or manufacturer to grocery stores, retailers or restaurants. 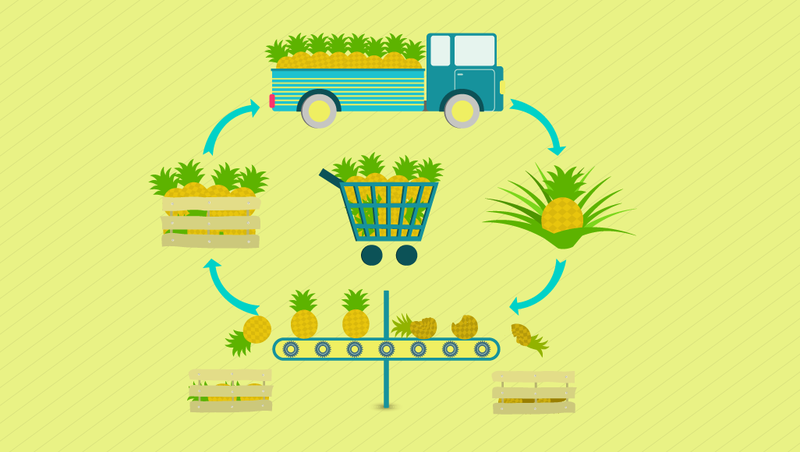 The majority of food reaches consumers via these traditional food supply chain models. Yet although the basic structure of the supply chain hasn’t changed very much, structures within the supply chain are changing rapidly. The customer-facing end of the grocery business is changing, driven by changes in consumer lifestyles and expectations for more variety and freshness at the lowest price. Today’s consumer is increasingly short on time, and seeking ways to save time and money on their grocery bill and food preparation – yet also expects a greater variety of foods to be available, and for that food to be fresh, healthy and abundant. A century ago, if a person wanted to buy groceries, they had to visit several stores to get everything they needed: a bakery for bread, a creamery for cream, a butcher for meat, and so on. As distribution networks became more sophisticated (think trains, planes and automobiles), these functions were centralized in a modern grocery store that could supply all the food and produce that consumers needed in one stop. This delivered value to the consumer, allowing them to save a great deal of time. They say the one constant is change, and the grocery business is continually changing to meet customer expectations for more value. Americans now spend more time working less time cooking than they did 50 years ago, but food freshness is still important. The advent of eCommerce is also changing how people shop for products. These factors combine to spell opportunity for food companies to provide value with services and products that save consumers time in their food shopping and preparation. These changes are behind the “meal in a box” trend, exemplified by startups like Plated and Blue Apron, and the move toward online grocery shopping and home delivery. As of 2016, some 5% of U.S. consumers preferred shopping for groceries online. In total, U.S. online grocery sales amounted to about $7 billion in 2015 and are expected to rise to $18 billion by 2020. Although early efforts to take the grocery shopping experience online ended in disaster (think Webvan), the food distribution industry is once again following many other B2C retail businesses into the realm of eCommerce. Grocery stores themselves are entering the online grocery space, as are companies like Amazon, with their AmazonFresh service, Jet.com, and Walmart. These changes at the retail end have upstream effects on food distribution companies. Consumer demands for lower prices, faster service, and higher quality products are increasing, and having the right products in stock at the right time is crucial. All of these combine to create a business environment where margins are tight, expectations for service are high, and errors are unacceptable, ultimately driving grocery stores and food suppliers to explore new ways to meet consumer needs and drive higher profits by adding value to the distribution process.